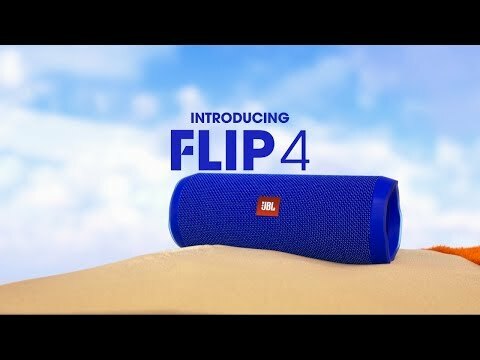 JBL Flip 4 is rated 4.4 out of 5 by 859. Rated 5 out of 5 by Chelz from Great sound I’ve used mine daily. Sound is great.. sometimes too loud so that is a huge positive. Great bass aswell. I'm really sad and dissapointed at the same time. JBL should give us an option to lower the volume of the &quot;turn on&quot; and &quot;connecting&quot; sounds - or even turn them completely off. Not everyone is using this speaker at the gargen party. I really can't turn on this speaker in my office! I got these information from various YouTube reviews and here's a summary of them: Bass wise, The Flip 4's bass is impressive, it packs a punch but it's not as deep as the Charge 3's. Battery wise. The 6000mah of the Charge 3 is needed for it's big drivers, and to charge your gadgets. In a word, it gives the same battery life span as of the Flip 4, since the Flip 4 has smaller drivers, a 3000mah battery is all that it needs (It will still depend on volume level and music). Loudness wise, the Flip 4 is loud due to the emphasis of treble, but bass levels stay the same. Whereas the Charge 3 is best in max volume, the treble and bass are further emphasized. But in moderate volumes, like 50-75%, the Flip 4 sounds better since the Charge 3 sounds a bit muffled in these volume levels. If you only listen to electronica, heavy bass songs and so on, the Charge 3 is a better choice, but if you are more into Pop, Rock, EDM and so on, the Flip 4 is a better choice. Portability wise, the Charge 3 is a bit of a hassle to bring due to it's size, but unlike the Flip 4, it is much easier to put in your bag due to the small size. Both can be grasped easily by hand. Protection wise, both are IPX7 certified, but take note that the Flip 4 doesn't float unlike the Charge 3 (in my opinion is kinda weird...) so don't drop the Flip 4 in lakes, rivers, the ocean and so on or it'll be difficult to retrieve it. But for me, the Flip 4 is my choice. But it depends on your preferences. Hope this helps!